In the last few years, both in academic circles and in the civil society, several authors (Bellah 1984; Putnam 2000; Etzioni 2004; Laimé et al. 2008) have expressed support for the restoration of community as a new form of social integration. In Africa, where some public institutions tend to be weak, this quest and the social and political contestations occur mostly at the community level. Communities are mobilized to become custodians of their environment (Scheffran et al. 2011) and there is a revitalization of initiatives for local development. In this essay, we look at the case of the “salt collectors” of the PinkLake, also called Lake Retba or Lac Rose, in the rural area of Dakar, Senegal, and the develop­ment of communities’ sustenance. It is based on previous publications by Papa Sow (2002), which analyzed the common uses of the lake’s resources. The Pink Lake might be best known for being the former finishing point of the Dakar Rally. The lake is located between white dunes and the seaside in the northeast of Dakar in the rural area. It is fed by groundwater and receives a large supply of Sangalkam village backwater and the dry lakes of Thor and Yandal in the neighboring province of Thiès during the rainy season. Yet it is struck by a fragile ecological balance. With a depth of only three meters, the lake is quite flat and the salt concentration of 380 grams/liter is higher than that of the Dead Sea (340g/l). In 1990, the area of the Pink Lake was estimated to be four square kilometers. In 2005 it had shrunk dramatically to about three square kilometers. The Lake has been on the UNESCO World Heritage Tentative List since 2005 because of its unique pink color. Some scholars argue that the symbiosis of the dune reflection, high magnesium chloride content and a bacterial carotenoid1 give the kind of red, pink or orange pigmentation (M’Baye 1989). In the 1970s, in response to persistent droughts and economic hardship, locals began to extract and sell salt from the lake in a self-organized way, initially to supplement their families’ income (Sow 2002). An estimated 5,000 people are now working and networking around the lake. Their livelihoods depend on the lake, and their jobs represent niches that local authorities cannot possibly fill through employment policies. The “salt diggers” have divided the lake into four adjacent sections, Khaar Yaala, Khoss, Virage and Daradji, which is where most economic activity occurs. “Can the salt diggers in the Pink Lake be described as ‘commoners’?” the editors of this book asked us. Salt collection techniques practiced at the PinkLake differ from various traditional and modern practices in Senegal (Sow 2002). To collect the product, salt diggers and porters step chest high in the water. The tools they use are simple: basins, sieves, shovels and spades, canoes with paddles called “niosse.” The canoes are usually leased from wood traders and transferred to the extractors’ ownership, who pay them either in-kind (five to six bowls of salt a day) or in cash. A new factory-made canoe costs 120,000-130,000 CFA (about US$250 in 2012). Salt diggers earn about 10,000 CFA/day (about US$20). The diggers leave a part of the lake dormant for six months so the salt can regenerate. Areas of digging are then changed twice a year, generally in April and October. Machines and engines are not permitted for harvesting. Extractors come from different backgrounds and social status, but generally they are peasants and harvesters who have abandoned their seasonal agricultural activities to dedicate themselves to salt digging. Most of the time, this job is a short-term activity used to earn money to migrate to Dakar or other West African countries to set up a business, and even to Europe. Tasks are divided among men, women and girls. Extractors are mainly men who dig the salt with large sticks and fill the boats. Women unload the heavy, wet, black salt from the boats. Young girls sell crafts on the shore and at nearby bungalows and hotels. Some men, called “Kola-kola,” bag the dried, now–grey or white salt after it has been iodized. Beside locals, other diggers include migrants from the Diourbel region of Senegal and from Guinea-Bissau and Mali. The Management Committee (MC), composed of 18 members of the five surrounding villages, was founded in 1994. It organizes the salt-extraction and commercialization, and aims to improve these activities by organizing collective actions. Each member is elected by its village organization (of different back­grounds and types) to represent its interests; a variety of local organizations also take part. Every three months, the Committee holds a general meeting where the activities are evaluated and new decisions are made. All Committee members get compensation for their commitment (the President and the Secretary General seem to be better paid). Although women play an important role at the site, they do not hold any positions in the MC. The MC is involved in outreach activities, including salt iodization in partnership with the World Food Programme (WFP), UNICEF and NGOs from Senegal and abroad as well as with the state ministries for the environment, commerce, health, industry, etc. The Committee lobbies to help salt diggers to know their rights and can sometimes exert pressure on local authorities. According to this Committee, salt production was estimated to be 50,000 – 60,000 tons in 2011. The production peak is during the dry season, and drops off during the rainy season (hivernage). The quality of salt varies throughout the year, with the best, coarse salt harvested in June-July. Over 70 percent of the salt is exported to Ivory Coast, with the rest sold to Mali, Benin, Burkina Faso, Guinea Bissau, Guinea Conakry, Congo Brazzaville, São Tome, and also to Europe, where it is used to de-ice roads in winter. In 2011, the price of salt was 25-30 CFA per kilo. The MC, which did not wish to disclose the details, receives a kind of tax from the buyers/traders for each ton of salt sold. Since none of the salt-extraction companies provide paper pay stubs, workers’ rights are constantly violated. There are no guaranteed wages, contracts or other legal agreements between employers and workers. In this context of conflict and simmering tensions that neither the State nor local governments can address, the MC was born to oversee and regulate the economic and social activities around the lake. The MC provides a kind of inter-local solidarity among migrants and other vulnerable, economically disadvantaged workers while also socializing the risks linked to the hard work of salt extraction. According to the MC, there is a common fund in which each salt digger contributes an amount of money and can take a portion as needed in case of disaster or accident. Here we see a “forced transfer” of responsibility from the State to the Committee for “risk coverage” related to employment. Although the Committee has managed to downplay the problems, it must be recognized that the responsibilities that it has endorsed generate new social and political uncertainties, some of which are described below. Land control and regulations: There is much confusionabout land tenure at the Lake (Traoré 1997). The Lake is officially recognized and classified as a mine by the State of Senegal, but the State does not collect royalties on its use. Taxes are only collected from hotels, tourism and art and craft vendors. A number of laws since the 1970s has transferred power to local authorities, increasing their responsibilities over natural resources and the countryside. This decentralization of authority has given rural communities autonomous spaces for their own initiatives for both public and private actors. Booming construction and urbanization around the lake have interfered with water runoff, and shells from the lake used in construction and industry have also caused ecological harm. The man-made degradation of the environment and the risks that this represents for salt diggers attract little attention. However, local authorities in cooperation with the state are working on the establishment of a “green curtain” to prevent the silting of the lake by planting trees on the adjacent dunes. Health problems and “debauchery”: Despite the use of shea butter to protect their skin, salt collectors complain about various skin problems. According to beliefs, rheumatoid arthritis can by treated by bathing in the Lake. Local lobbies and traders have not yet found opportunities to use such healing properties commercially (as some European countries and Israel have) by offering medical bath therapies. With the salt production boom, much banditry and “debauchery” suddenly appeared. One of the most-wanted fugitive companions of “Ino,” a famous Senegalese gangster, was arrested at the site while working secretly as a salt “collector” two years after being accused of a 1994 murder. The MC appealed to remove what they called “unhealthy places,” to prevent crime. 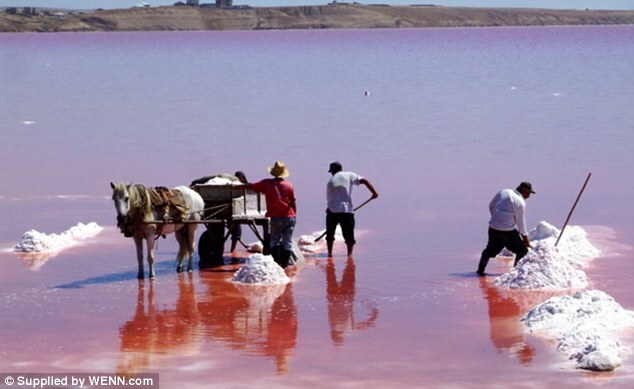 In 2004, local authorities ordered a “clean up” of Pink Lake. The main reason given for eviction was the construction of new rental homes around the lake. So it was somehow “hunting poverty a step further.” Bulldozers came and destroyed the “village of the harvesters” – the temporary settlement of the workers who used to camp on the site – and authorities made them move to surrounding villages and let them come to the Lake only to work. Senegalese labor regulations are inadequate for protecting property and individuals, so salt diggers at the Pink Lake must provide their own security. Workers themselves have set up checks and penalties for failures to adhere to regulations and local norms, but the legal or juridical scope is quite limited, so sanctions are applied only to existing normative or customary obligations. The credibility of the system set up by the Committee (and by extension the salt diggers) is based on the regular inspection of conditions of work activities, the strong support by all stakeholders (Rural Council, organizations of the surrounding villages, salt diggers, etc.) and their ability to report breaches. One of the main indicators of the effectiveness of collective action is the ability to lower litigation and conflicts brought in front of what seems to be actually the only “legal” and “recognized” authority: the MC. Some examples of conflict resolutions: If somebody is accused of robbery and the crime is proved, the MC sanctions that person by excluding them from working on the site for six months. If somebody is caught in battle or serious dispute he or she may pay 5,000 CFA and be excluded for three months. The salt diggers are serious about environmental responsibility in their work, and the Management Committee representing them imposes strict measures to prevent overuse of the lake. These measures include ley harvesting (seasonal regeneration) and prohibition of engine use for salt harvesting. However, no studies have been done to evaluate the efficiency of this approach, and there is no information on regulations of the number of the diggers. Also, hydrological and geological data of the lake have not been analyzed. Yet evidence of manmade environmental degradation, climate change and other threats at Pink Lake clearly exist. The precise causes and magnitude, however, have yet to be established. Elina Marmer (Germany) has a PhD in climate research and investigates climate adaptation strategies in African countries at micro and macro levels. She is a Marie Curie Fellow at the University of Hamburg and an associate member of the research group, Climate Change and Security, KlimaCampus, Hamburg. Bellah R. N. et al. 1985. Habits of the Heart. Individualism and Commitment in American Life. Berkeley, CA. Harper and Row. Etzioni, A. 2004. From Empire to Community. London, Palgrave Macmillan. Laimé, M. et al. 2008. Les Batailles de l’eau. Terre bleue, Nice. Mbaye, E. M. 1989. “Protection de l’environnement. La Cas du Lac Rose.” Mémoire ENEA, Dakar. Unpublished. Putnam, R. 2000. Bowling Alone. The Collapse and Revival of American Community.New York, Simon and Schuster. Sow, P. 2002. “Les récolteuses de sel du Lac Rose (Sénégal). Histoire d’une innovation sociale feminine.” In Géographie et Cultures 41:93-113. Scheffran, J., Marmer, E. and Sow, P. 2012. “Migration as a Contribution to Resilience and Innovation in Climate Adaptation: Social Networks and Co-development in Northwest Africa.” Journal of Applied Geography. April 2012 33:119–127. Traoré, S. 1997. “Les législations et les pratiques locales en matière de foncier et de gestion des ressources au Sénégal.” In P. Tersiguel and C. Becker, eds. Développement durable au Sahel, Karthala, coll. Sociétés Espaces, Temps: 89-102. 1.Editors’ note: Carotenoids are tetraterpenoid organic pigments that are naturally occurring in the chloroplasts and chromoplats of plants and some other photosynthetic organisms like algae, some bacteria, and some types of fungus. Wikipedia entry, “Carotenoid,” at https://en.wikipedia.org/wiki/Carotenoid. In developing countries of Africa, poverty is high and the path shown by the salt collectors and traders of Senegal is a commendable way of living with economic and environmental responsibility. This collective way of life is worth emulating in other parts where ever possible.